...it is Chess Bedsole, 35, a Birmingham attorney, who is the most impressive.... THE DAILY recommends Chess Bedsole for the Republican nomination for auditor. Read "Janie Baker Clarke and Chess Bedsole for auditor" from The Decatur (AL) Daily. 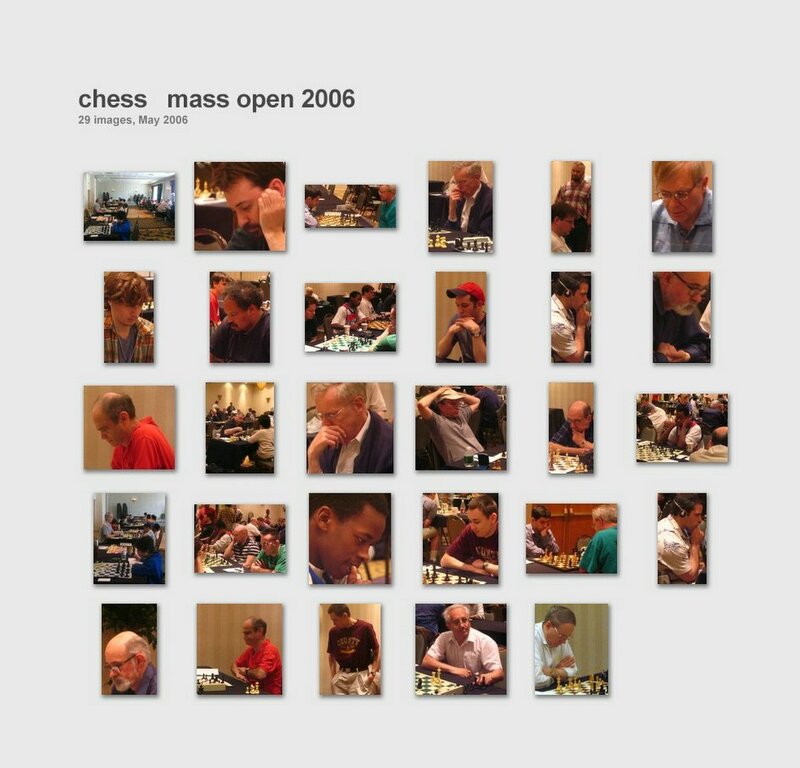 The 2006 Mass Open, which serves as our state's championship, served up a number of interesting chess stories for yours truly (Jason Rihel). As the 2nd lowest player in the Open section, at USCF rating 1903, I certainly wasn't expecting to win any money. In fact, I was just hoping to avoid the inevitable lowest rated- player bye. As you shall see, not only did I avoid the bye (sort of), I ended up with a split of the Under 2150 prize. I also ended up with a new player to publicly excoriate on this blog-- Matthew Davey. Here is a quick round by round account. I encourage other players to also post their experiences-- it is fun to hear what happened to other people, and more than one lesson can be had. Round 1: In a back and forth game, I finally secured a drawish endgame against a near-master (2190). My rating finally kicked in, however, as I proceeded to trade into an inferior rook endgame, which I thought was also an easy draw. Wow, that assessment was wrong, and I soon toppled over my own king. Round 2: I got a second black in a row, only this time I braved my new opening-- 1.e4 c5. I have played this about 5 times, and I was afraid to use it against these strong players. It was clear that both me and my opponent were playing through the fog of fatigue, and many mistakes were made. I finally won when my opponent made a serious tactical error. My quest to avoid a bye lasts another round. Round 3: I have white against Josh Bakker, rated 2144. Josh ultimately shared the Under 2150 prize with me, in a sort of cosmic justice. After a difficult tactical game, I repeated a position 3 times. As I was moving my piece into position for the 3rd time, I declared, "This is a three fold repetition of the position," and I reached to stop the clock. Josh immediately said, "No, it was only twice," and he immediately played a move to break the repeat. As the clocks were both dipping under 30 seconds, I panicked, looked at my scoresheet, couldn't tell what was going on, and then stupidly made a losing blunder. After the game, Josh admitted he didn't properly know the 3-fold rule-- it applies to the POSITION not the MOVES. He wouldn't have allowed it if he had realized. Of course, I should have just calmly stopped the clock and got a TD. Also, instead of making my move, I should have left the piece in place, stopped the clock and said, "I am about to make this move, which is a 3 fold draw", and grabbed a TD. Round 4: I catch a strong player in my favorite tricky opening. He is tactically lost by move 10. A little theory can go a long way sometimes, and I was happily sitting at a 2.0 even score. Round 5: I struggle in a position where I am worse for about 50 moves. I lose a pawn to a 2100, and then he trades down into a Knight and king endgame. I hate games like this one-- losing the whole time, and yet there is a glimmer of hope for a draw that keeps the blood flowing. The end result didn't seem in doubt, but I would bravely fight on to the bitter end. But suddenly, I have a dangerous passed pawn, and now his extra pawn disappears, and now *I* have the winning chances! I think I will analyze this endgame here another time-- I found it very instructive on the power of an active king, and it wasn't clear during the game where my opponent went wrong. In the end, it petered out into a draw, but it was very exciting! Round 6: Matthew Davey. Matthew Davey! Matthew Davey? He was to be my last round opponent, but he put his tail between his legs and fled, giving me a forfeit win. I guess I got the full point bye after all! Now, this breach of chess morality happens all the time, but Matt Davey put an extra special spin on it. He actually WAITED to see who he was going to play before he left, because he wrote it on the pairing sheet-- FORFEIT. Perhaps to his surprise, he was playing a lowly 1900, who happened to have a better score than he did and would have white. Looking up Mr. Davey, I see he just made 2100 with his results, so I imagine he didn't want to risk his rating to me, but if he had a pairing against a stronger player, then he would have stayed. Oh sure, I was then handed the under 2150 prize, but I would like to earn it. Not only that, a loss to Mr Davey would not have impacted my big rating gain, but a win or a draw would have pushed me very very close to 2000, because of bonus points I would get. If he just would have told the TDs, I would have gotten a new opponent. OK, so I am speculating a bit on Davey's cowardice. There are other possibilities-- while checking the pairings, he has a massive heart attack, he only has time to write forfeit on the sheet, no time to find the TDs before being rushed to the hospital. Instead of a heart attack, maybe it was a rabid dog attack. If something like this happened, then I take back my hex. In the end, a very fun tournament for me. GM Ivanov won, Chris Chase recovered from two tough draws on day 1 to take clear 2nd place, and a bunch tied for third in the Open section. Boston Globe Staff Photographer Suzanne Kreiter came by the club and snapped some pictures -- one of which has been included in the Globe's "The City Seen" series. Click here to check out the photo and listen to Suzanne's audio commentary on why she ended up at the club and how she set up the shot. i've been playing chess ... almost every night. My best move ... is still, "uh.. can we start over?" If you are new to the club, you may not realize that the Boylston Chess Foundation has a Championship Cycle. First, we hold the Weaver Adams U1800 Championship. Two winners from the Weaver Adams then qualify to play in the Reubens-Landey U2200 Championship. Two winners from the Reubens-Landey can then play in the BCF Championship along with BCF masters. Only current club members can play in the Championship Cycle, so it is a perfect excuse to join or rejoin if you are not currently a member. 4SS; 40/90, G/30; Open to BCF members rated under 1800. Entry fee: $20. First two winners receive free entry into the Reubens/Landey U2200 BCF Championship. Registration: 6:30 - 6:50 pm Rounds: 7:00 pm. Weaver Warren Adams was born on April 28, 1901 in Dedham, Massachusetts. He was an American chess master who participated in the U.S. Championship in 1936, 1940, 1944, 1946 and 1948 and won the Massachusetts State Championship in 1937, 1938, 1941 and 1945. Weaver Adams won the 49th U.S. Open, held in Baltimore, in 1948. In 1939, he wrote a book entitled "White to Play and Win." After publication he played in the U.S. Open at Dallas where he did not win a single game as White (3 losses and 1 draw) and won all his games (4 games) as Black! He also wrote "Simple Chess", "How to Play Chess", and "Absolute Chess." ...after being asked to please apply for the chess game so I can be used, I was finally told that none of us will be pieces. Cochrane figured Chess was the perfect dog to challenge what she considers a bad law." I thought she would put a good face to it," Cochrane said. "She's a cute, well-behaved dog and we needed that. 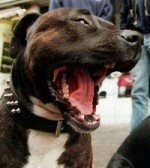 We are just one example of lots of pit bull owners." Chess can't chase balls or play with other dogs in the park now because Cochrane is legally bound to keep her leashed and muzzled anytime the dog is outdoors. America's Foundation for Chess (AF4C) today announced that, together with Holland America Line, it will be hosting an exclusive luncheon on June 11 aboard the ms Westerdam, which will be docked at the Port of Seattle. Attending this first-time-ever event as a guest speaker will be David McEnulty, whose success in teaching inner-city kids chess inspired the A&E movie 'Knights of the South Bronx.' Guests will also witness a blindfolded grandmaster chess match and savor a five-star meal. With no winners, isn't everyone a loser? Stories like this just drive me nuts! There will be no losers in the chess tournament being played at Charles Bejarano Elementary School. "They're all winners," said Larry Guerrero, their volunteer chess instructor who took over the Chess Club when two previous volunteers' jobs required them to give it up. "Just by being here playing chess, learning the moves, learning to strategize, think several moves ahead, they're all winning," Guerrero explained. "It's not so important that there be a winner," he continued, "but that they compete, play the game with one another. That's how they learn. "There won't be any losers. We're rewarding participation." But there will be a prize, a hand made travelers chess set donated by Guerrero's daughter, Laura Pierce of Las Cruces, NM. It will be awarded to one of the students by way of a drawing. All the club members will have an equal chance of winning it. Neither shall they play chess anymore. Jaan Ehlvest is one of the few Grand Masters who has higher education. Robert Huntington, former chess reporter for the Associated Press, has recently started a blog that is providing coverage of the Turin Olympiad. Check out this post for background on Robert's chess and journalistic travails. For the record, I played Robert several times in the late 70's when I was in high school. I was thinking I might try to dig up the games, though I'm sure the scores would be embarrassing for both of us. CAISSA, the muse or goddess of chess, was originally a nymph in a poem of that name composed by Sir William Jones in 1763. Nick Jong discusses Monster Chess. ...a variant in which the white player only has the king and four pawns but can move twice each turn. Apparently the extra moves may outweigh Black's material advantage. The naive black player's confidence at having eight pieces and eight pawns to white's one piece and four pawns quickly transmutes into fear of the monster king, which is difficult to checkmate but which can easily mate the black king by itself. It's not Dehorsey; it's Deknight!! Read "Dehorsey wins chess tourney" from the Leominster (MA) Champion. Investing in solid companies with short-term woes is a lot like playing chess, says Michael Carmen, manager of Hartford Growth Opportunities. "It's all about figuring out what will be working later in the game," he says. 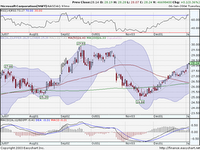 Read "Stock Picking as Chess." Give him a hint and I'll kill you! In chess, the endgame is the part where there are only a few pieces left on the board, and the players circle each other warily, like dogs sniffing one another's rear ends. Read "Let loose the dogs of reality TV - Contestants sniff out their competition as networks gear up for May sweeps" at Canoe.ca. Last night I dreamt that I lived on top of a hill in the shell of an old stone building. It was full of flies and old black chess pieces. A couple of new multi-media entries in the chess sphere: Video #3 at Chess Talk and The Closet Grandmaster's first podcast. 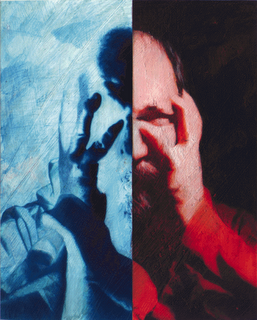 The second issue of Underground Review is now available for download -- a lot of art and philosophy, not so much chess. Is this a good or bad thing? You be the judge. A couple of bloggers have announced their retirements (either temporarily or permanently): Knight Errant Salcido and Qxh7#. Several others have been reclassified as inactive without such fanfare, including previous sidebar residents Loren's Chess Blog, The Patzer's Tale and Ajedrez por Sertal and Knight Errant Funkyfantom. A couple of other Knights, St. Patzer and Smith Morra, have been quiet for awhile. Is the Errant clan going through a shrinking phase? In the opposite direction, Chess Improvement Efforts reemerged with a new title - My Critical Chess Positions - and Schach und nochmal Schach posted again after a long hiatus. Among newer listings, Chess Boxing Club Berlin might be of interest. Chess Poetry - Special Edition! I know that very few of you look forward to new installments in the Chess Poetry series, but this one is special. It is a poem by BCF Member Manus Patrick Fealy entitled "The Boylston Club." Swiss Systems: not too much. Honey plays the Center Counter. Tea sometimes plays the Dutch. Is it permissible to play chess on Shabbat? So to summarize, chess - yes; clocks - no; and don't separate the white and black pieces when putting them away after the game. It's also nice to see no mention of beheading for violating the rules. Now available for download -- "The Chess Hotel", the newest record from The Elms (whoever they are). I don't understand the Wikipedia. I know that it's an encyclopaedia that anyone can edit and how to look up the codes, but that's a bit like telling someone "The Queen can move as far as it likes in any direction, the Bishops can only move on diagonals..." and then saying they understand Chess. If I notice that the floor I am walking on is tile, then I walk on the tiles in the manner of a knight in chess. Hence I try not to pay attention to what type of floor I'm walking on. We played checkers and chess and made the players mate and all this other stuff. It was quite funny. They had interspecies chess children. An Infectious Diseases specialist who has won one of the rare Infectious Diseases Society of America awards asked me today, "how do you trade the first case of human avian flu in the U.S.?" I think the checkers answer is to buy Gilead or Biocryst, but I think the chess answer might be to sell insurers, retail, and travel stocks. A solution to GM draws? It happened at the Phuong Trang Cup which wrapped up last Sunday in Ho Chi Minh City when one of the finalists accepted "defeat" though his king was under no threat. Spectators shouted at Nguyen Vu Quan of Hanoi after he "lost" to Truong A Minh after only 22 moves. The organizers have not said if the affair would be referred for police investigation. It was this last line that got me thinking ... if premature draws, suspected sandbagging, etc. were always referred to the police for investigation and possible prosecution, I suspect we'd see a lot less of them. Congratulations to Blunder Prone for completing the circles. He hasn't indicated whether he plans to continue to blog about his post MDLM graduation experiences, though I suspect he will. Chris Kilgore has launched a successor blog to Adventures in Georgia Tournament Chess. Check out Tao of Chess. About.com has been offering a flurry of items related to the chess blogosphere: Add Chess Blogs to Your News Service - Elsewhere on the Web : Blog Tripping in April - Chess Blogs : First Posts. In addition, they now maintain a list of Top Chess Blogs. As everyone knows, it is not that hard to find out personal information about just about anybody by searching the web. Sometimes it happens completely by accident. I was looking at chess-related items from Google Blog Search and came across this post which gives me a pretty good idea about where the blogger behind Chess Dude lives and who his landlord is. Let's just call it the "Amazing fact of the Day." Jeff has a water balloon fight at the college tomorrow that I plan on going to watch. The teams are Theatre and Art against the Chess Club. It's going to be a great showdown! Love is like a game of chess with strategy and tactics? Apparently I'm not the only one who is playing real bad chess right now. Don Q reports that he jumped back into tournament competition after a year long hiatus and achieved the worst performance rating of his life. He played so badly that one of his opponents accused him of sandbagging his rating for future events (ouch!!). I guess the moral of the story is that you can't just do the circles, walk away and assume that the positive effects on your play will be permanent. Realizing this, Don (having recently completed his weight loss quest) has decided to get back on the saddle and ride again. That's right folks, the Knight of all Knights, the Man de la Maza is back! In the last round I was scheduled to play FM Chris Chase. We decided to try and start the game about 20 minutes early in order to shorten our day. However, we were having difficulty getting everyone in the main playing room to quiet down so we could begin. In particular, a couple of Michaels (Griffin and Derazhne) were loudly analyzing their game from the previous round. Finally Chris shouted out, "Hey Mike! If you guys don't quiet down, the blogger is going to write about you. Then you'll be in big trouble!" "That's right", I piped in. "Chess players from all over the Netherlands will hear about your actions. If you show up at Corus next year, they probably won't pair you." "Show up? ", added Chris. "They won't even let you into the country." To be honest, I really don't know what "occupying the next available gap" means from a chess point of view. Do you? Hey buddy, can you spare a pawn? 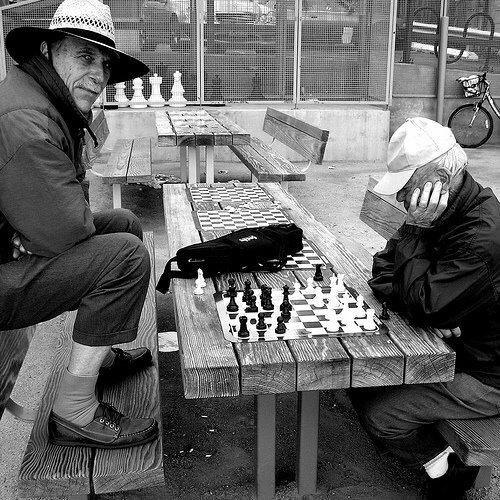 A variant which will test your crowd control and social work skills, as well as your chess knowledge -- Human Chess with the Homeless. ...where there is an odd number of people in a group and everyone takes turns moving for each side so everyone is competing against everyone including themselves rendering a competitive spirit null and void. 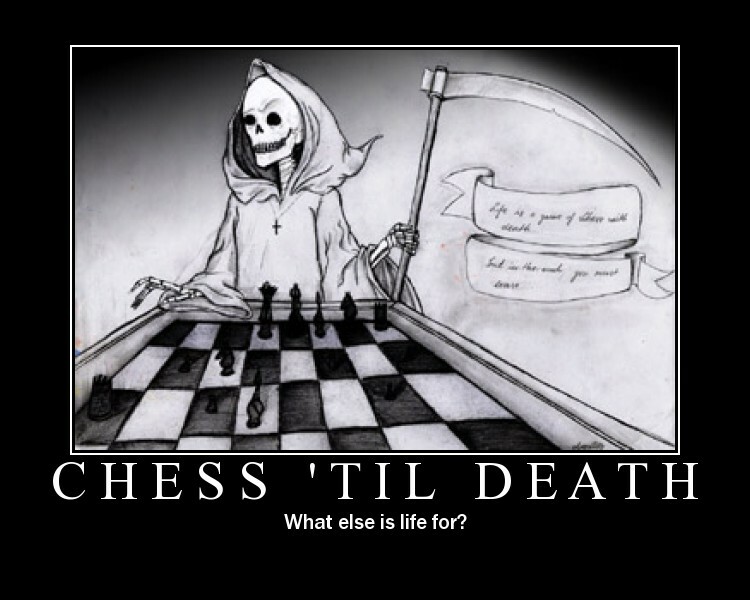 Have you ever played chess and been in a situation where you know defeat is inevitable, but for whatever reason, it's taking the opponent awhile to finish you off? That's what life feels like to me. I wish life would either finish me off or "make a mistake" allowing me to get back in the game! The Swedish tax authority is demanding nearly $11.6 million in back taxes, fees and interest rates from Bjorn Ulvaeus on royalties from ABBA's hits. 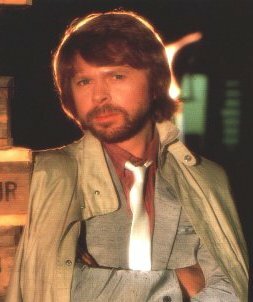 According to the Swedish tax agency, Ulvaeus signed a series of contracts before moving to England in 1984. The contracts were meant to hand over the rights to his royalties from ABBA songs and the musical Chess to different companies. But the agency claimed in a decision made in December that the deals were sham contracts and that Ulvaeus still had access to the money and should include them as his personal income. Wayan offers a slice of life in the form of a chess bum in D.C.'s McPherson Square. Miller and Bard are power pitchers coming from different sides while Woodard uses more finesse to get hitters out. A former state chess champ, he has the background for staying a pitch or two ahead of opponents. Ten blogs have been moved into Inactive status in order to start off the new month with a clean slate. Included are a few "brand" names: Jim Eade's Chess Journal, Duveltje's Schaakweb, GM Gata Kamsky's Chess In Life, Satish Talim's Online Chess Blog and King's Gambit. In an unrelated note, I wanted to assure folks on both sides of the issue that BCC Weblog is open for business today, though no illegal aliens will be posting.